Damon Huard. 2007 series stats. All cards are minimum NM-Mint condition. Up for sale is an authentic autographed card. 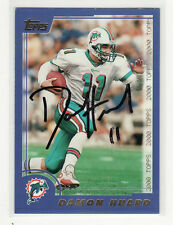 We are committed to providing collectors with a wide selection of authentic autographs. We spend many hours each week searching for new authentic autographed. 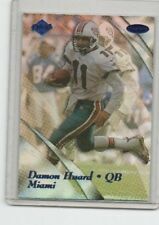 Damon Huard Miami Dolphins/ Washington Personally Autographed Card My family and I have been collecting autographs for over 35 years. We go to the Football HOF in Canton Ohio, Baseball HOF in Cooperstown, NY as well as other events to get autographs. 2008 Panini Scorecard 149 Damon Huard. Set: Scorecard. Team: Kansas City Chiefs. Product: Panini. Card Number: 149. Year: 2008. SKU: FT B0002 R03 A (66). Serial Number: 649 made.